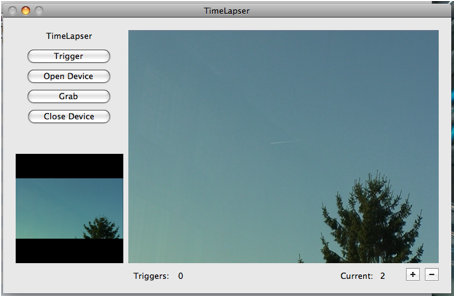 Lapseler is a small utility that allows you to record time lapses movie on your Mac. It uses any webcam, built-in iSight, DV camera, … and any device that is supported by QuickTime. Because it’s build with the latest libraries of Mac OS X it can also uses HD DV cameras. It should run fine on x86 or ppc Mac 10.5.x Leopard and 10.6.x Snow Leopard. Lapseler is made to record a set of picture frames and add them into a movie. 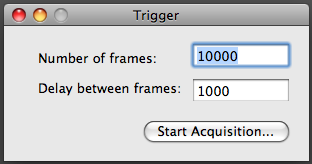 The number of frames to take and the delay between each frame can be easily edited. The delay between frames is in cents of second. 100 means 1 second. In this screen shot we will ask to record 10.000 pictures and we will wait 10 seconds between each pictures. Once you click on “Start Acquisition” the video device will be opened and it will start to record your time lapse. Is the easiest way to start a time-lapse. Will start the preview of the select video device. The preview will appear on the small view on the bottom left of the main time lapser window. It can be used to tune your video device before starting a time lapse. Will add a new picture into the time-lapse movie. If the device is not open it will start it. The purpose of those +/- controls is simply to allow you to tests your configuration and settings and then quickly compare different pictures grabbed. The preference dialog is where you select the device to use and all the details of the video file you want to generate. 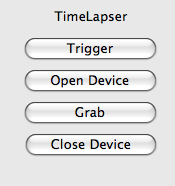 Here you just select the input device to be opened when you start a time lapse. 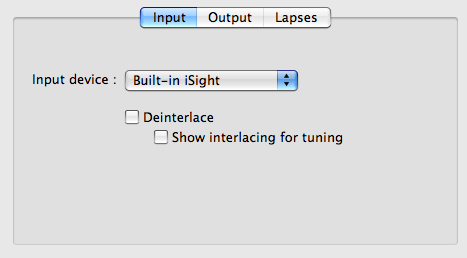 If your camera is generating interlaced visuals you should select “Deinterlace”. The “Show interlacing for tuning” will show clearly if the de-interlacing algorithm is working fine. The de-interlacing uses a lot of CPU time so you should avoid using it when not needed. The output preferences pane is where the generated format can be selected. The resolution can be set to “From input device” and in that case the visuals are left untouched. In that case the video device will impose the resolution. This option is nice if you want to have no post processing and resizing done on the pixels. If you select a specific size for the output the software will scale up or down the visuals. The resize function is a very high quality one from “Schumacher, Dale A., General Filtered Image Rescaling, Graphics Gems III” You can experiment with various settings, the fastest is Box and the best should be Lanczos3. You can change the filter while a session is running or simply open the device and grab a few pictures and compare them with the +/- buttons on the main window. -	QuickTime photo jpeg should be the format of choice if you want to work with the resulting file with an editing application on the Mac such as FinalCut or iMovie. Photo jpeg is a good trade off between producing files that are relatively well compressed and still having a very good quality. -	Flash FLV are compatible with the flash player and should be very simple to host directly on your blog or web site. -	QuickTime PNG is a format that leaves the visuals almost uncompressed and so is a very high quality codec. However this format will generate huge files. Most of the time you should be fine with photo jpeg. The FPS is the frame rate of the movie produced. The FPS is an important parameter that allows influencing the fluidity of the movies produced. The most universal value is 30 frames per second. However it’s nice to be able to produce content at 60 FPS if you intend to use the video loops in a live remixing application such as ArKaos VJ, GrandVJ or MediaMaster. 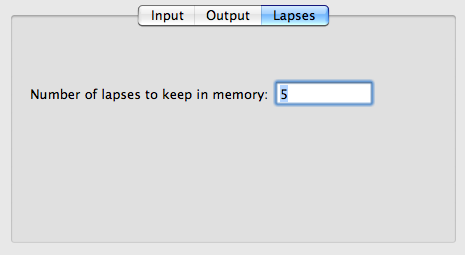 This just allows selecting the number of lapses to keep in memory. Being able to use the + / - buttons on the main window is a simple way to review them with the settings or the camera position and then compare the various results. If you set this setting to a high value the application will use much more memory. 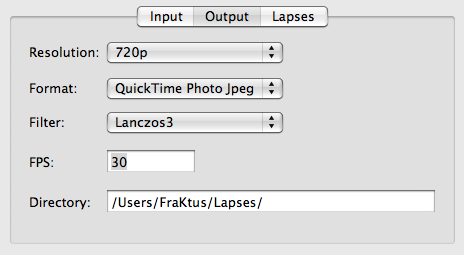 Lapseler is compatible with HD cameras as long as you have the right extension added to QuickTime. By example to use a Sony HDV camera you need to have FinalCut installed on your machine. You can check that by going in the /Library/QuickTime folder, if you see there a file such as DVCPROHDVideoDigitizer.component then you should be able to grab HD pictures. Lapseler uses a very efficient upgrade framework called Sparkle to keep the application updated. The second time you launch Lapseler you will have the opportunity to change the automatic upgrades automatically. Lapseler is ©2009 by Marco Hinic, All Rights Reserved. This documentation and the software described in it are copyrighted © 2009 by Marco Hinic with all rights reserved worldwide. It may be freely distributed and copied as long as the resource files and documentation remain unchanged from their distributed form. You are encouraged to make copies and give them to anyone you like, again so long as they remain unchanged. Neither the package nor any of its components may be sold or bundled with any software that is sold, including shareware, without written permission. We make no warranty, express or implied, concerning the reliability of this product, and accept no responsibility for any damages caused by use or misuse of this program. All trademarks and registered trademarks are property of their respective holders. IN NO EVENT WILL MARCO HINIC BE LIABLE FOR ANY DIRECT, INDIRECT SPECIAL, INCIDENTAL OR CONSEQUENTIAL DAMAGES RESULTING FROM ANY DEFECT IN THE PRODUCT, INCLUDING LOST PROFITS, DAMAGE TO PROPERTY AND, TO THE EXTENT PERMITTED BY LAW, DAMAGE FOR PERSONAL INJURY, EVEN IF MARCO HINIC HAS BEEN ADVISED OF THE POSSIBILITY OF SUCH DAMAGES. Neither the name of ranchero.com or Brent Simmons nor the names of its contributors may be used to endorse or promote products derived from this software without speciﬁc prior written permission.